I was cleaning out my makeup bag the other day and I thought I'd share some of my favorites with you. I fell in LOVE with Benefit makeup ten years ago. 1. Benetint: It gives your lips the perfect tint and doubles as a cheek stain. 2. Ooh La Lift: It works magic on my under eye circles. 3. High Beam: It makes you glow. 4. Creaseless Cream Eyeshadow: My favorite shades are R.S.V.P and Flatter Me. Check Benefit out, the packaging it beautiful and the goods are GOOD. 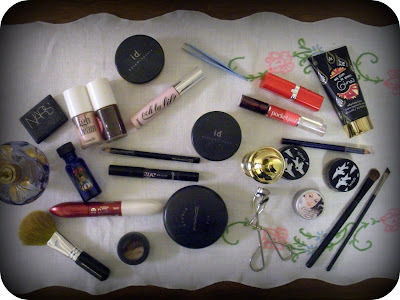 Do you have any favorite beauty products to share?